Molly is a Dutch made English language film that was directed by Colinda Bongers and Thijs Meuwese (who also wrote the story). This very much has the feeling of a comic book with a Mad Max style overly bright look to it and exaggerated performances by the characters throughout. While I had my issues with the main character I did find the camera work to be most impressive. It has been a few years since apocalypse swept the globe and Molly (Julia Batelaan) is a scavenger trying to survive in the harsh new world. Her identity comes to the attention of Deacon (Joost Bolt) a local warlord with over the top showman qualities. He recognises her as the woman of local legend who is said to have psychic superpowers, and so he comes up with a plan to capture her so that he can transform her into one of his supplicants (zombie like creatures) and have her battle in his fighting pit. While this isn't a bad film and certainly wasn't boring I just thought the main protagonist was just awful. She came across as a mix of Tank Girl and Alice from Resident Evil with the exaggerated mannerisms of Jillian from Ghostbusters and that is as bad as that sounds. The character wears the most ridiculous clothes, moves and acts in an abrasive 'kooky' manner and was just so off putting for me. Her character is played seriously despite this which was probably a good thing but I just did not like her. One place she does shine is the many fight sequences. The directors take the approach of Daredevil with protracted fight scenes that are all done in a single moving shot, so as the fights go on you can see characters visibly getting exhausted making the action sloppy. This is where the titular Molly does excel though, she is legendary and the antagonists fear her, yet watching her in action she never seems to really know what she is doing, taking just as much punishment as she gives out as she scrappily brawls. These fight scenes were mostly all quite entertaining, though a later fight against Deacon's main henchwoman did get a bit dull as it seemed endless taking up too much screen time with characters just rolling around on the floor trying to do choke holds on each other. These fights work so well just in how the camera moves around, like Daredevil you will get characters fighting off camera, and then get bodies flying into view. There were also zombies of a type, they had an animal like movement of crawling around on their arms and legs, but they were consistent and while lacking any feeling of threat led to some nice classic zombie moments of hapless people being swarmed by them. 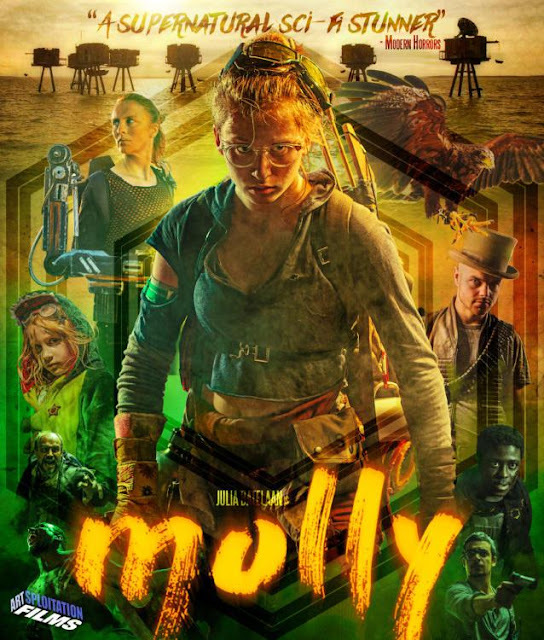 As much as I disliked Molly herself I enjoyed the over the top world she exists in that despite only being post apocalypse for a few years has gone very much the way of Mad Max with everyone wearing clothing made up of rags, sci-fi body armour, gas masks and steampunk goggles. Sure it is derivative but that does seem the general consensus for what apocalypse does to fashion! Everything is brighter than it seems it should be and looks gorgeous as a result, coupled with the over the top acting of much of the cast and this feels like it stepped right out of the pages of a comic book. The story has as much depth as a comic also though with it seeming to be a minor side story at best, nothing world changing here, not that that is a bad thing. The stakes are low when the antagonist is an ineffectual loser. There is plenty of scope for a sequel, from Molly's unexplored origins (shown via a few flashbacks), to the cliffhanger ending suggesting a bigger plot at play. Talking of Molly once again we are shown she has a variety of special powers, from force style pushes to having screams that can kill, this all felt like it was cribbed from the Resident Evil films so I couldn't help just thinking of that whenever they made an appearance. 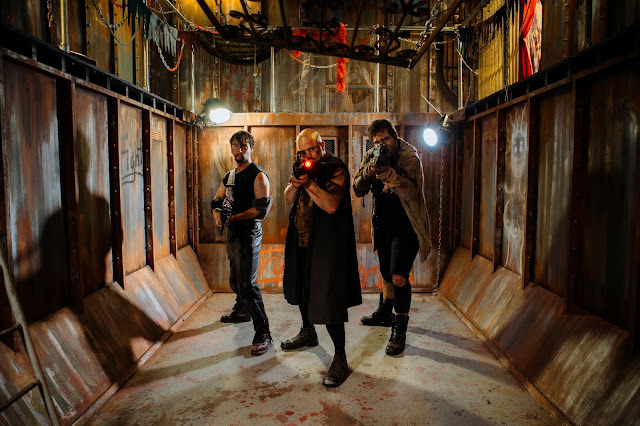 When you boil Molly down to its roots it is a series of cool looking, nicely choreographed fight scenes that work due to the impressive camera work, the neat cinematography and the spirited performances of the actors. While I didn't think much of the main character I was able to look past that, though I sometimes felt I was enjoying this for how it was made rather than for what is was trying to tell. Still I can't deny this moves at a blistering pace that despite a lack of character development stayed entertaining from beginning to end. Molly is released on October 2nd on Blu-Ray, DVD and Digital HD that includes iTunes, Amazon Instant Video, and Google Play from the great people at Artsploitation Films.